The VM90 chuck is for those who prefer to operate the chuck using the quick- acting TommyBars (levers), which saves time when mounting and dismounting. The VM90's compact size makes it ideal for use on 300mm (12in) capacity lathes or smaller and is also ideal for use with the Vicmarc Bowl Jaws. On a lathe with a spindle lock only one Tommy bar needs to be used to close the jaws, by pushing the bar away from the operator. 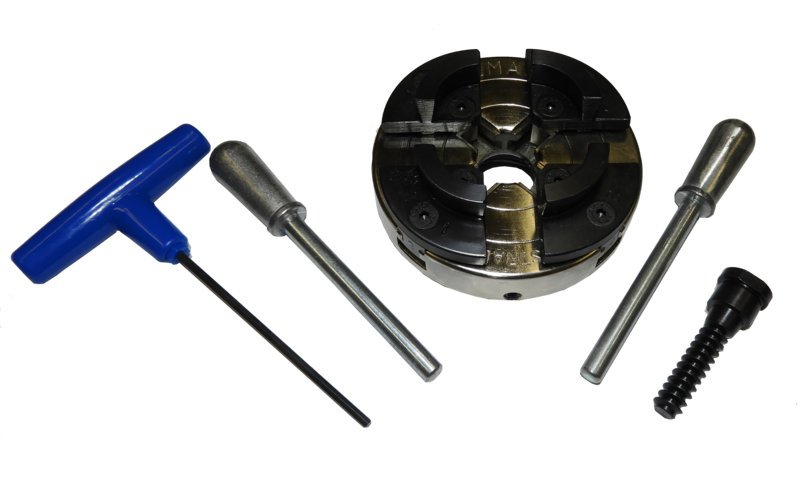 Basic chuck includes: 1 x Standard Jaws, 1 x 3mm T-Bar Allen Key, 1 x Woodscrew, 2 x 7.9mm Tommy Bars, and owner's manual. Please note: for this insert type chuck, an appropriate insert to fit your lathe is required.